Capadia Designs: A Wonderful Surprise to Share! 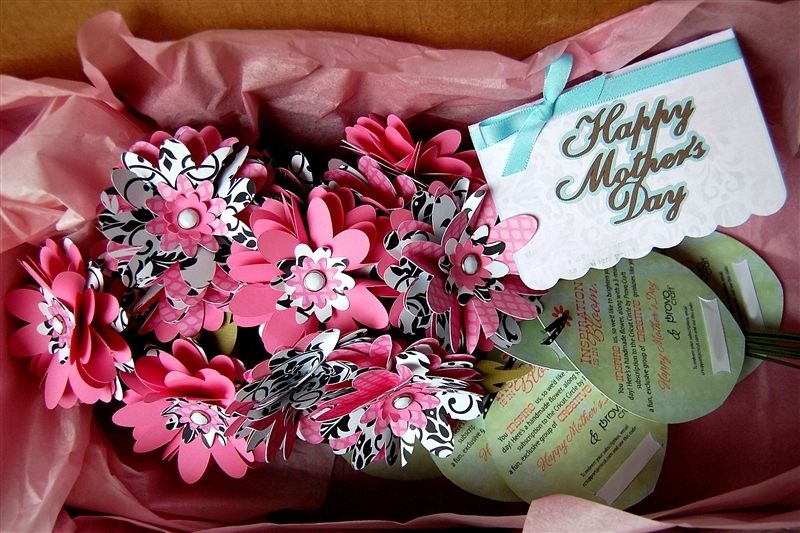 I received a package on yesterday - a totally unexpected Mother's Day gift from Provo Craft! I had been waiting for the Buccaneer cartridge that was one of the Cricut Cruise gifts to arrive but when I saw the large rectangular box, I wondered why they would put a cartridge in such a big box. I opened the box and found this beautiful bouquet made by the Provo Craft Design Team. 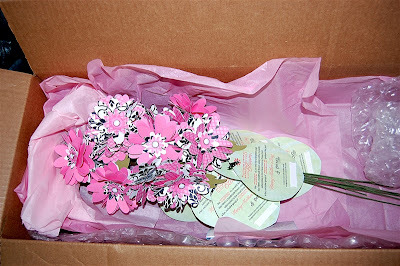 The flowers were nestled in pink tissue paper and bubble wrap and they were a bright and beautiful sight on a rainy day! 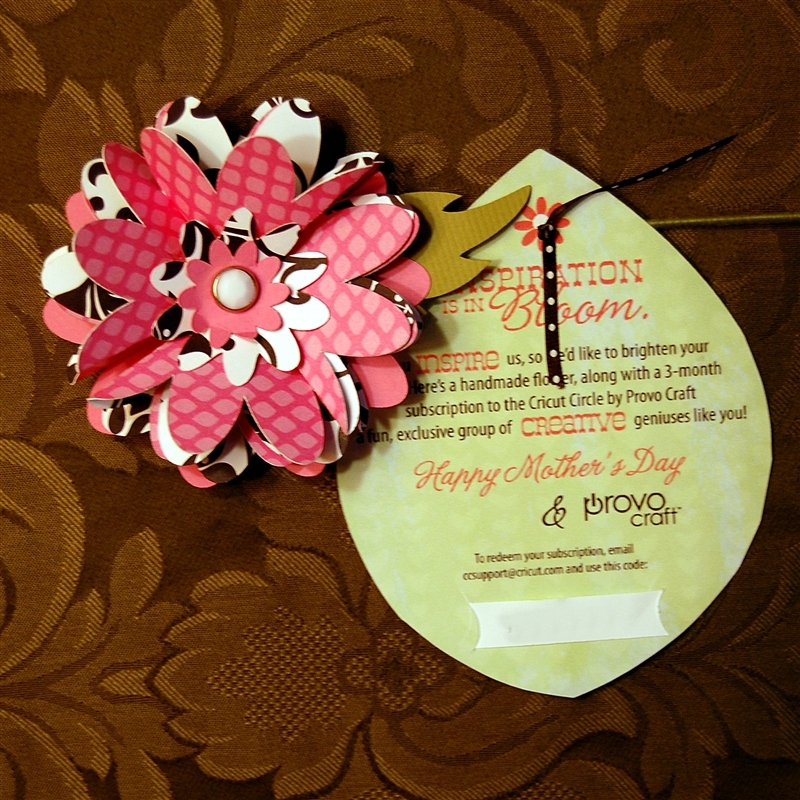 Each of the flowers had a tag with a Mother's Day message and a code for a 3 month subscription to the Cricut Circle. There was a card with a note which encouraged me to give 11 of the flowers to members of my community to invite them to become a part of the Cricut community. I gave away the first flower Wednesday night (and I just realized I forgot to sign the tag!). My neighbor was very happy to have a chance to try the Circle. I have "enabled" her into many Cricut purchases so it was fun to have something nice to give her that I know she will enjoy. 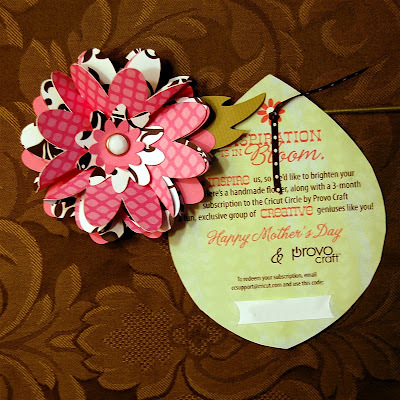 The Cricut Circle is a community of crafters who enjoy creating with the Cricut and other tools offered by Provo Craft. There are many benefits to membership including a message board, blog and a magazine that are available to members only. There are challenges and giveaways run through the Circle blog. Circle member also receive discounts and double reward points on purchases at Cricut.com. There are special events held around the country and some other perks, for example, Circle members who purchased the Cricut Imagine at launch received a free "Lori's Garden" Imagine cartridge. The normal quarterly cost is $79.99 and this includes an exclusive cartridge that is sent to the members. I purchased a yearly membership when the Circle started last year. I believe the intent of this gift was for me to share these flowers with local people and I have a list of people in mind. However, since I don't know 11 people in my immediate area who own Cricuts, my plan is to share some of these flowers with my virtual friends as well. I don't want to make this into a competition or to "recruit" followers by offering the memberships up as a prize. I do need to know whether you are interested in trying the Circle since I wouldn't want to give this chance to someone who won't use it. If you are a current member of the Circle, you are not eligible for this subscription. So leave a comment and tell me where you live and why you'd like to try the Circle. I will choose some people and will contact you privately so be sure to give me an email address or some other way to get in touch. If you don't want to leave personal information in a comment, just send me an email at capadiadesigns@gmail.com. By the way - I did figure out how the flowers were made and I will share directions as soon as possible if you'd like to try to make these. Several people asked about using the linky tool to add a project and participate in the challenge I posted yesterday. I took some screen shots to show you how it works. Oh wow! Such a great mothers day gift! I just recently started scrapbooking/cardmaking this past November when I got my cricut. With all the supplies and carts I have purchased the cricut subscription was not in the budget. I would love the chance to try it out!! I would love to try the C. Circle. It was just a little pricey for me to join. I simply LOVE my cricut and would be lost w/o it now. Whoooppppss.... I forgot to tell you what part of the country I reside in. I live in West Georgia....Not far from UWG. In would absolutely love a chance to try out the circle! I've been on the fence because although it seems it would be worth the price it is a bit costly and I would want to be sure it is worth it before I take the plunge in a membership. 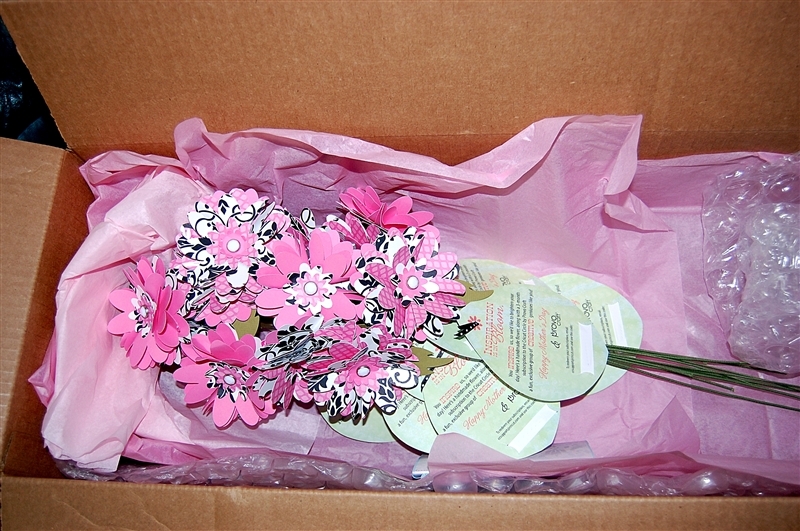 I do like how generous they were with you and it is a lovely bouquet, I am from Maryland.Thanks for sharing! What a great Mother's Day gift this would make. I live in Texas. Have looked at the Cricut Circle group a few times but have debated the value. I have a friend who joined and says it is totally worth it. I think I would enjoy the blog and challenges most. Thanks to you and Provo Craft for a chance to win. Hi Diane - What a nice gift for you! And it is so generous that you're willing to share them with some of your followers! I would love the opportunity to try the Cricut Circle - I went back and forth when it was first announced and finally decided that it was a little bit rich for my blood. I've been a DS user since almost the first day it was introduced and I'll never forget the help you provided to me! You probably won't remember but years ago, when I was trying something in DS, you agreed to look at my .cut file and taught me how to burp! My mother is the only other person who can say that!!! Thanks for sharing your talents and for the opportunity to win a peek at the Cricut Circle. I've wanted to try the Cricut Circle since I first heard about it. This would be a great opportunity to check it out. So generous of you to offer to share. What a beautiful bunch of flowers. I would love to try the Circle. Didn't really think I could justify the cost, even though there is a cartridge that they have that i would love to have. I'm in New Jersey. Thanks. I would love one of these...could even come and get it, as I live in Southern NH! Not to mention I would love to meet you! Gorgeous!!! This is really awesome work. This bunch of flowers are looking so fabulous and cute. This flower with that cute jar is looking great. Thanks for this great job. What a sweet suprise! 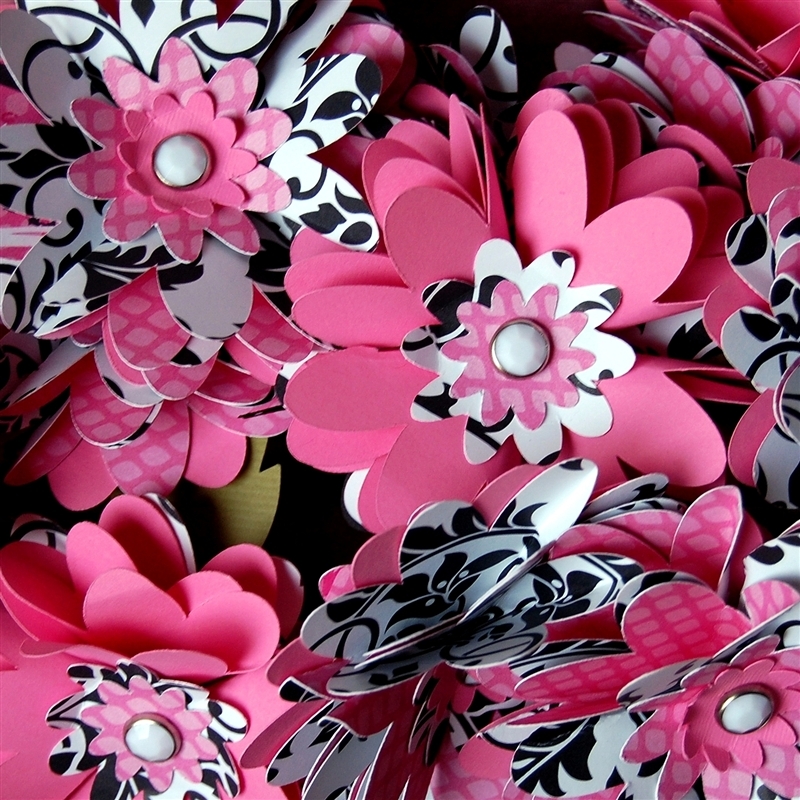 I am wanting to make flowers with brad centers for my mother's day cards. 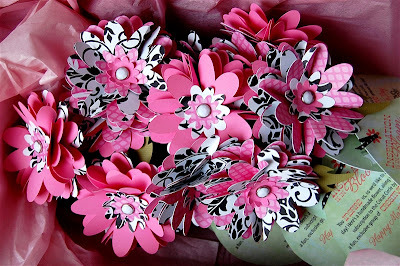 I would love for you to post directions tomorrow, so I can make these flowers! Please!!! I live in La. and I would love to try out the Cricut Circle. I did not join in initially, because of the price- I didn't know you got for the price and if it would be worth it. I simply love everything cricut and could not live with out my expression. I am really wanting the imagine at this point. - - Thanks for all your inspiration! Such fun and excitement for you! About a year ago. I found my Cricut, and it has opened a door to reviving my crafty time. It had been 10 or so years since I was able to rediscover my love for crafts. Parenthood certainly came first! And I wouldn't change a thing. Your emails have been informative and have aided in that time too! I have looked into the Cricut circle before but couldnt justify the cost. So Thank You for the chance to get a taste of what the Circle has to offer. Wow, Diane! What a fabulous gift!!! I would just love to try the Circle for many reasons....I've been drooling over it, But my very scrap-supportive hubby just doesn't see the purpose of paying to join a 'club' to get perks....maybe if I'm able to get a free trial, and he sees what the members get out of it, then he'll be willing for me to pay...that would be AWESOME!! Also, I live in Maine, and the aren't that many Cricut users up here, or at least I haven't found many! My whole Cricut world is on the Internet, and the Circle would just open up a whole new realm of possibilities! Oh wow, Diane, the more I write, the more I want it!! :) thanks for the opportunity! What a nice thing to share with us. I would love to try the circle! I live in western Massachusetts. Thanks for the chance. The Cricut Circle is on the top of my "I need" list. However, a few months ago my husband lost his job and the cost of the subscription is just not in the budget. I live in a tiny town, 70+ miles from anywhere to purchase crafting supplies, magazines, and necessities. As such, winning a three month trial would be a good way to see how helpful this magazine really would be for me. I am very new to the Cricut Realm and love everything about it and Crafting with the machines. I follow your blog and thrive off of the inspriation I get from it. thank you not only for the opportunity to try the magazine, but also for sharing your talent with the world. Since I spend all my crafting money on Cricut Carts (really!! ), I don't have any left for the Circle. Would love to join! I have 3 Cricut machines, a baby bug, an Expression and two days ago I got the new E2 as a Mother's Day gift, which I am so excited about! Will send my contact info to your email...(just saw a feature on the morning news about internet safety and identity theft!) Thanks for sharing your "flowers". Maybe they would share the "flower recipe" with us??? Hi Diane! I love the bouquet you received. I would love an opportunity to try the circle out. I have hesitated in joining due to the cost of it. I was not sure if I would get a good return on my investment. A free trial would be awesome! I live in good old rainy Washington state, where I am convinced spring and summer are never going to come! I emailed you not too long ago about joining the Circle. I was on the cruise and I heard a lot of the ladies talk with excitement about the Circle. I have not seen so many people so involved with the cricut. I felt the excitement and want to experience it. I retired in January and just recently my mother passed away. The Circle would add something to my retirement that is needed. I really enjoy reading your blog. I am in Pennsylvania. I would like to be a circle member but couldn't justify the price at this time. I would love to try The Circle. I have been considering it but as it is a little expensive I have been hesitant to make the jump. I live in east-central Kansas. I do not have any scrapbooking stores in town so have to travel about an hour to a craft store, so many times I do not have the supplies I would like. Since the passing of my husband crafting has been a lifesaver, something to keep my and my mind busy. Thanks for a great opportunity. Happy Mother's Day to you!!! What a FUN gift and surprise!!! The flowers are gorgeous!! I'd love to try the Circle out. I was seriously contemplating joining last year...but it is expensive and I don't always like the "special" cartridge so couldn't justify it. This would be a great way to try out the Circle community and see the ideas and creativity!!! Thanks for the chance!!! Hugs from West Des MoInes Iowa!!! I am from Michigan. I would like to be a circle member. What a Beautiful surprise PC, sent you. I'm Geri from YUMA,AZ. I have not been scrapping/card making very long (about 6 months. my wish is to be able to be as creavtive as you, I love your work!!! This is where the Cricut Circle would help me alot, I don't have a big Cicut Cartridge collection yet, but I am trying little by little. Thanks for the oppertunity for winning such an awesome prize. Happy Mother's day to you!!!!! Hey Dianne! been wanting to do the circle but could not figure out how to do so. I think it would be good to have an exclusive cart each quarter as they seem to be very specific types of carts. love your blog and get a lot of knowledge and inspiration from it!!thanks. kathy b. Thank you for the opportunity to win a membership to the cricut circle. I would love to join, but with a limited budget I spend money on craft supplies(cricut cartridges take up a big chunk)and I try to find crafting inspiration free on the internet, which is why I enjoy reading your blog. 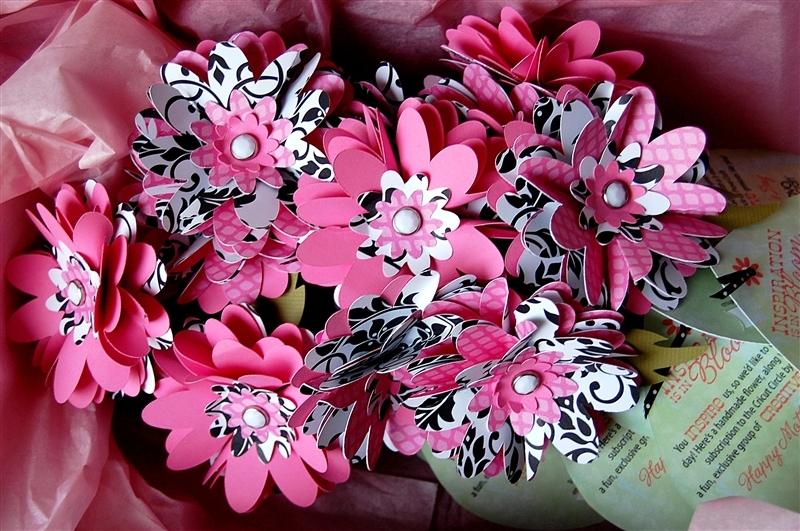 These are just gorgeous, I would love the be in the Cricut Circle, I have tried to join and send emails and never had a response. Not sure if they allow us to be in when we are in Australia, could you find out for me I would appreciate it. Enjoy your lovley flowers. I brought my laptop out to my craft area and just finished making a card from the Create a Critter cartridge for one of my daughters friends, when I decided to check my email and found this posting. I am hoping that it is fate that brought my Cricut use and your generous opportunity together. I would love to have a chance to join the Cricut Circle as I would not be able to afford the subscription due to being laid off and on a very tight budget now. I certainly have to the time to dedicate to the circle and would be able to use it to my fullest, and I would love to learn more about my Cricut and this chance would help me greatly. I cant wait to find out how to make the flowers, they are really gorgeous and Im so happy for you to get such a wonderful surprise. Thank you so much for sharing some of your flowers and giving us a chance at such a fantastic prize! What a wonderful surprise to receive. I would love to try the Cricut Circle. I live in sooutheast Texas. I don't know anyone with a cricut, only my blogger friends. This would be great. Maybe I'll get lucky. Thank you, Diane and Provo Craft for this chance. You both rock. Wow!!! What a great surprise for you, and for some of your friends. I would love to try the Cricut Circle. It has always intrigued me, but the price was a deterrent. So, hopefully, I will be one of the lucky "virtual" friends!!! Thank you for your great blog. I love looking everyday for new posts. WOW! A big hat's off to ProvoCraft! What a creative way to spread the word :-) I seriously considered the Cricut Circle last year, but just couldn't quite bring myself to spend the money. I have been using my cricut a little more lately, making some journals and other 3D crafty things. Being able to try out the Circle just as summer and more free time in my schedule coinside would be perfect timing! Thanks for the opportunity~! Happy Mother's Day, Diane! What a great gift form PC! I keep telling people what a great company PC is and this is just one more story that I can tell to confirm it. 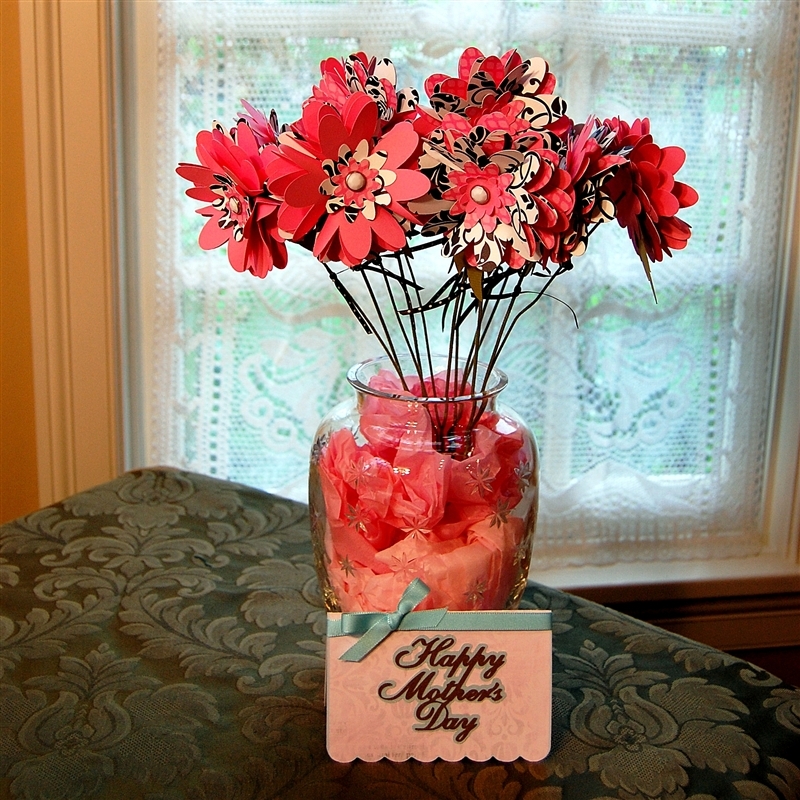 And I also want to thank you for sharing how to make these (I am still making flowers from your earlier file and love them). I have been tempted SO many times to join the Circle but back down at the last minute. And the last time that I almost took the plunge was when your "evil twin" talked about how much she is enjoying it! This would be a great opportunity to 'test drive' it before I commit completely. Thank you for this chance to do something that I have wanted to do for a long time. I live in North TX. BTW, Happy Cinco De Mayo to you too! It is nice to see Provo Craft support you girls who do so much for them! Thanks for the chance to win this cool prize! thanks for the chance.....and you should see my word verification...too funny! WOW!!! I cant believe Provo Craft would could up with such an amazing gift! I would LOVE to try Cricuit Circle, I live near Jacksonville, Florida where we had formed our own "Cricuit club" which recently ended I would love to have the opportunity to try it and be able to learn so much more form other crafters. My email is srtaperez (at) gmail (dot) com. Happy Mothers Day and i hope you love your new cartridge. I've often asked how to become a circle member on message boards...haven't gotten an answer yet! I would love a chance to see what it's all about! I live in California and have had my cricut for 3 years. I also own the jukebox, and the gypsy, as well as the software. I own too many cartridges to list. If I had been a member of the circle, I wonder how much $$$ I would've saved by now!? This is such an awesome thing for PC to do for us Mothers! I would really like to try the circle out!! I would love to try the circle. I have had a cricut for 3 years, and am ready to step it up. Plus having recently retired, I have the time to play! Thanks for the opportunity! What a wonderful Mothers Day gift for you and to be able to share it just makes it that much better.I have been a circut user for two years now,started with the baby bug and then Hubby got me the expression.Have lerned so much from you I feel I should be sending you something wonderful for all you do.Would love to try the cricut circle membership. Wow,what a surprise, i would love to join the circle , but thought it a little expensive, I am in SW Fla and met you briefly when you were in Ft. Lauderdale for the cruise. How generous of you and PC. Of course like everyone else, the Cricut Circle was out of my budget. But I think it would be neat to see what goes on with it and to be able to be the first in the "know" about things Cricut. I am currently residing in Mountain Home, Idaho. Thanks for an opportunity to win. I sent you an email (about an hour and a half ago) about why this Cricut lover and addict would love, love, love to be a Circle Member!!!!!!!!!!!!! Diane-What a wonderful thing to receive and give! I would love to try the circle because since someone you and I know and love has had to disband our little on-line group, I have missed the fellowship and sharing so much! Maybe the Circle would be my answer! 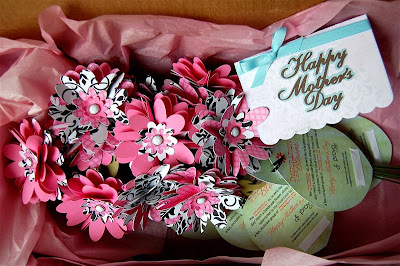 Oh how beautiful, what a suprise that would be to open that box and find those lovely handmade flowers. Guess what I am making a few lucky Mothers for Mother's Day?? I live in a tiny town called Arizona City, AZ. Smack dab in the middle of Phoenix and Tucson. What would I do with Cricut Circle?? I'd play and play. I'd probably end up loving it and need to get a full scrip, but would love to check it out. I live in the middle of England, UK. What a wonderful gift to receive! Such a surprise for you! I live in Utah and bought my Cricut when they first came out. I'd love to try the Circle. Thanks so much. Wow!! Thank you for this wonderful opportunity. I Live in Northern California. I would definitely use this as I am a complete fan of Cricut just that budget doesn't let me get all their items. Being in the the circle will let me feel like I can be part of something that I know I can't unless I get some money. Thank you so very much for this opportunity. What a lovely surprise, Diane. I too, would love to try the Circle. The cost kept me from accepting the initial invitation. I have the E and Imagine, Gypsy and DS. Thanks for offering the opportunity. Have a fun Cinco de Mayo! I would love to win the membership to the Cricut Circle. I'm not very familiar with it but love anything Cricut. This is very generous of both Provo Craft and you Diane. Thanks for this chance, I really wanted to join the circle when it came out but it was very expensive so I'm having to wait but I look at the message board and blogs all the time for great circut ideas. I love all of my cricut products and enjoy making crafts for my family friends out of cricut items. I live in Utah. But to try the circle would be amazing so thanks again. Gorgeous flowers and what a wonderful surprise! I live in Sacrameno, CA and would love to be able to taste test Cricut Circe for 3 months! I had looked into it before and was wondering what the benefits were other than the cartridges. Sounds like the community piece is really great. I have a baby bug, expression, imagine and a gypsy...would love to expand my knowledge and project share with others. BTW - It is becz of a tutorial that you posted, that I know how to weld and hide contour on my gypsy. Happy Mother's Day and thanks for sharing! What beautiful flowers and what a welcomed gift they must have been. I have been scrapbooking and card making for some time and love my cricut. I considered joining the circle but being on a tight budget I wanted to wait and hear more about it. I would love the chance to try it out. Thank you for sharing your ideas and contests with all of us. 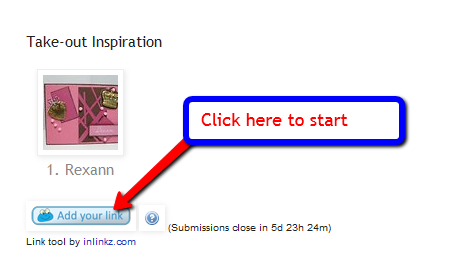 I check it out daily for inspiration. Diane, what an amazing gift! I am from the desert in California. I would love a chance to try the Circle. I haven't done it yet because the cost is a little than I can afford without knowing that it is something that I will use regularly. I recently found your blog and have learned so much from you in such a short time. Thank you so much for the chance to win something so wonderful. I have been dying to try the Cricut circle but with our finances the way they are these days I just can't afford it. We live in southern California and it is so expensive to live here! My DH finally got a job after 2 years of unemployment but it is a huge pay cut compared with what he was making before he got laid off. We are grateful for his job though as it gives him experience to put on his resume. We are hoping he can find something more permanent since this is just contract work with no benefits. So needless to say I haven't had much money for crafting so I really hope you will consider me. Thanks to Provo Craft for such an awesome gift! What a great gift from PC! I have been thinking about joining the Circle. Thank you for giving us the opportunity to win a try for free flower. I'm also planning to go to the summer CHA, so it would be great to attend the circle events there. Everyone was talking about it last year & I would love to be part of it, even though I can't afford to commit the $ to it. I would love to be part of the circle. I have followed all of ya'll on your get-togethers with your pictures & so much fun, & comradery. Happy Mother's Day. I would love to see what the circle is all about, I have held off because of the traveling to swarms. I am paralyzed and traveling is hard for me. But the more I see of the circle it is alot more than swarms. I live in Calif just outside of L.A. and I grew up not to far from you just outside of Springfield, Ma. Have a Happy Crafting Day!! I would love to try out the cricut circle. I just could not afford the extra to pay for it so winniing this would be great thanks for all you do and for sharing your amazing talent. ohhhh what a nice Mothers Day surprise from PC! And I'm so glad you figured out how to do the flowers!!! I would love a chance to check out the circle....I'm a stay at home caretaker for my hubby and would loved to have joined but just couldnt see spending the extra money at the moment! Thanks for a chance and Have a good Mothers Day! What a fun surprise. Your flowers are beautiful. I would love to try the C. Circle but unable to afford it a the moment. I was so excited, I forgot to tell you that I am from burlington, ontario which is nestled between toronto and niagara falls... thanks again! I would love to win the CC membership. I am a Senior Citizen and doing my best to make ends meet, especially since I have such good Cricut enablers. So being a CC member wasn't in our budget. I especially love making cards and giving them away. The last 4 years I have made a calendar for each month with a Cricut picture on the side and these I give as Christmas gifts. So if I became a member hopefully I would pick-up a lot of new ideas so that I could pass on new creations. What a very nice thing for you to share. I would love to try it the circle, my crafting budget is extremely low and it would be awesome to get some cricut advice. I love these flowers. What a great suprise. I would love to try the circle. I think it would be great to be a part of a such a great community. I love everything Cricut. I just got the E2 and can't wait to create with it. The flowers were pretty in their package... but after seeing your arrangement, they were much more beautiful. I received an invitation from Cricut last year for the Circle, but as I had been unemployed for quite a while, I just couldn't afford it. Thank you for the opportunity to, hopefully, gather some confidence and actually DO something with them besides dust them. Wow! I would love to try the Cricut Circle. It was so expensive I couldn't justify it but I would love to try it. Thanks for the opportunity. I live in Saratoga NY. there have been many times I have thought about joining the circle but couldn't bring myself to spend that much money on it. Thanks for for a chance to try it. I just got my expression for Christmas last year. Since then it has been my constant companion. My 9 year old daughter and I have had so much fun exploring it's functions and spending great hours crafting together. Having a trial quarter with the cricut circle would let us create even more great crafting projects together and take our crafting to the next level. Oops forgot to post the location! Emma and I live in the beautiful Shenandoah Valley of Virginia. Diane: Congrats on getting the lovely flowers from Cricut. Happy Mother's Day to you and to all of your followers. What a wonderful gift you and Provo Craft are sharing! I live in a small community (1800 people) in Nebraska. I've been seriously considering trying the Circle for a quarter to see if I liked it but I was taking some classes to finish my BA degree and DS is graduating high school next weekend. It just hasn't been the right time for that expense. I'd love to be a member of the circle and truly can't wait to see how those beautiful flowers were made so I can give them a try! I would love the chance to try The Circle! I knew I wanted to save for the E2 so I decided not to do the circle. I live in Tennessee and I hope you choose me! Wow! What a nice surprise to come home to. I don't know a single girl who doesn't love flowers. 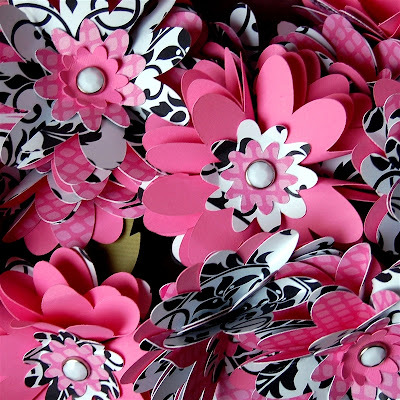 And paper flowers, even better. They will not die on you in a week. :) This here Florida girl(pick me! pick me! pick me!) would love to give the Cricut Circle a try. It's been on my want to do list since they first announced it. I still miss reading the circle blog. I read it everyday when it was free for those few days back in the beginning. Happy Mother's Day! How lucky you are to receive a bouquet from PC! How lucky we are that you're gonna share w your fans! I'd love to try the circle to see what it's about. As most of us live on limited incomes, we don't have the priviledge of paying for something before we 'see' it, or know what it's really about. I live in ND...way up north. I don't know how close any of their get togethers would be for me to be able to attend, but it sure would be fun to meet some of the mb friends. Thanks for sharing! Those flowers are beautiful! Such a sweet gesture too from PC. I haven't been able to join the Circle at this time as I just bought a house last year, and in addition to purchasing the supplies for that, I've had to build an entire scrapping collection over again since I had previously shared it with my mom. Of course all of this leaves me with little funds, but so many projects i want to create. Even if I don't get picked though, I'd love if you would share any secrets about how to make the flowers as they'd be great to give my mom. the flowers are beautiful, nice detail from PC. I am new to the cricut community, so far I love it and I would love to try the circle too, I hope you pick me ;) Any way, thank you for sharing and for the inspiration. Have a lovely Mothers day! What a wonderful pay-it-forward type of gift! I would love to receive a gift like this. I live in Northern California and would use this gift to fill up my hot summer days! What a fabulous gift from PC!! I live in Utah and I would love to have a chance to get a 3 month membership to the Cricut Circle. Right now it is not even a option for me, cost wise, because I am a mom to three little ones and we lost our business a while ago and my hubby hasn't been able to find steady work since, so it is just a struggle to pay our bills at this time. Having a Circle membership will be so fun to gain wonderful ideas from the Cricle community and maybe take my mind off the bills for just a little bit. Thanks for the opportunity to win!! Thanks for giving us a chance for a 3 month membership. I have always wondered if I would like the Circle. Would love to learn what it is all about. I think it would be a great way to test drive the club. So glad PC is trying to give people a chance to check it out. Congrats on getting the flowers and sharing how they are made! Gotta try that. I would love to try the Circle out. I'm near you, in Massachusetts. Your work is such an inspiration and you are so kind and generous to share your talents with us. Thank you for this great opportunity. I myself am a member but my DIL who loves everything Cricut wants to join so bad so she can come with me to events in the area but they are strapped with money and 3 kids LOl as is everyone. It would be great if she could join me. Her name Is Melissa Merkel her email is Melissamerkel@comcast.net Thanks for the chance. Wow what a wonderful opportunity! Oh wow what beautiful flowers. I have the imagine so I would love to have a trial run in the circle! I have wanted to do be in the circle but my hubby said no because I got the Imagine! Oh I forgot to tell you I am in Alabama! I have wanted to try the Cricut Circle but not sure if the cost is worth it for me. It would be wonderful to have a 3 month trial. I live in Mississippi and I love your blog. Thanks for sharing! Beautiful flowers PC and so sweet of you to give these away!!! wow. What a great giveaway. I would love to join the circle. I haven't yet because of costs. I would love to see the wonderful circle exclusive projects and contests. Waht a wonderful gift from PC. I live in BC Canada and we don't seem to get the things that are available to everyone in the US. I craft with my Granddaughter and the children in the meighbor, so i would love to win this. I would love to be a part of the Circle. My husband has talked about it but he's afraid I wouldn't really find it worth the money and would just wish I'd spent the money on cartridges. I'd LOVE this chance to know for sure !! I don't really know much of anyone here in ID that has a Cricut.Thanks for this chance ! I would LOVE to join the cricut circle for 3 months,I would sooo love to try it, it would be so neat to use the cricut craft room & all, I just bought the new E2 on Hsn & it would be nice to use it with the circle group!! I would like to try the circle just to see what it's all about. Plus I would share with my mom and review it for my website. And I really, really would like to find some local cricut junkies! I would love to be in the circle. I have not joined yet because I can not see that the price is worth it, but possible if I get a taste of it so to speak, I will be hooked. Thanks for the chance to win this 'taste'. I just moved from MS to TX with the military and am hoping to find some friends to scrap with here. What a wonderful surprise! I live in southwest Missouri, in a rural area. The nearest craft supply store is 45 minutes away ( and that's only Hobby Lobby) Any more stores are over an hour away so I do a lot of online "window shopping" before I get to a store anywhere. I really wanted to join the circle when I received an invitation, but my husband just started new treatments for RA and we don't know how much out of pocket expense there will be yet. I would love the chance to try it out! Thank you so much for the wonderful chance to get a 3 month subscription! My best and I LOVE to scrapbook and have been seriously considering joining the circle! A 3 month trial would help us decide whether it is right for us! Thank you so much again and happy mothers day! Wow, what a gorgeous bouqet and how generous of Provo Craft. I have considered the Cricut Circle but haven't joined. A 3 month trial would be a lovely opportunity to try it. What an amazing gift and idea...I can't wait to try and make these....I would LOVE to send some to my 90 year old mother who could enjoy them all year long!!! Thank you for this opportunity to win a beautiful flower!! I'm going to loo into the Cricut Circle and find out more!! I just stumbled upon your blog and its great - I am not a followerer! I live in Ontario Canada and would be honoured if you chose me to receive an invitation to the circle. I have wanted to join for a very long time - since it opened - but I am a student and am not able to work much because of my studied so my money is limited and I just can not spend that much on the subscription. I am a member of the cricut board and receive lots of inspiration there but I know there is so much more to be had on the circle board. I am also in love with this quarters cartridge! I would love to own it! I think it is so great that you are giving away a bunch of your flowers - and congrats to whoever is lucky enough to receive them as I am sure they are much deserved.